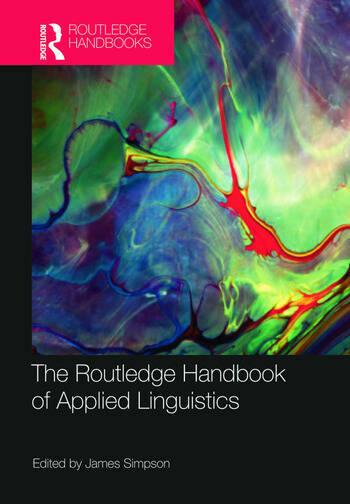 The Routledge Handbook of Applied Linguistics serves as an introduction and reference point to key areas in the field of applied linguistics. descriptions of language for applied linguistics. The forty-seven chapters connect knowledge about language to decision-making in the real world. The volume as a whole highlights the role of applied linguistics, which is to make insights drawn from language study relevant to such decision-making. The chapters are written by specialists from around the world. Each one provides an overview of the history of the topic, the main current issues and possible future trajectory. Where appropriate, authors discuss the impact and use of new technology in the area. Suggestions for further reading are provided with every chapter. The Routledge Handbook of Applied Linguistics is an essential purchase for postgraduate students of applied linguistics. Editorial board: Ronald Carter, Guy Cook, Diane Larsen-Freeman and Amy Tsui. "This is a superb collection of chapters that illustrates the robustness of applied linguistics. The volume coherently documents the fact that the field has come a long way since its early focus on the teaching and learning of languages beyond the first. Anyone interested in understanding the scope of applied linguistics at the start of the 21st century would do well to consult this work."